King, the European makers of the hit game Candy Crush Saga, today moved one step closer to an IPO in the U.S., filing an updated F-1 with the SEC that priced 22.2 million shares between $21 and $24, to raise up to $532.8 million and value the company at around $7.6 billion. The move comes weeks after King filed an initial F-1 with a maximum aggregated offering price of $500 million. The moves demonstrate that — despite the lingering spectre of King social games competitor Zynga’s volatile stock, and arguments that gaming companies, with their revenues heavily dependent on the hit of a single game, may be better off staying private — free-to-play giant King and its backers (Apex being the largest, with others like Index Ventures also holding significant shares) are stepping up to take advantage of public markets that have largely been rewarding tech IPOs. Even if Candy Crush Saga — or King’s other popular free-to-play games like Pet Rescue Saga, Farm Heroes Saga, Papa Pear Saga and Bubble Witch Saga — will eventually see a decline, that’s not the case for now. In December 2013, it said that 128 million daily active users were playing its games more than 1.2 billion times per day. 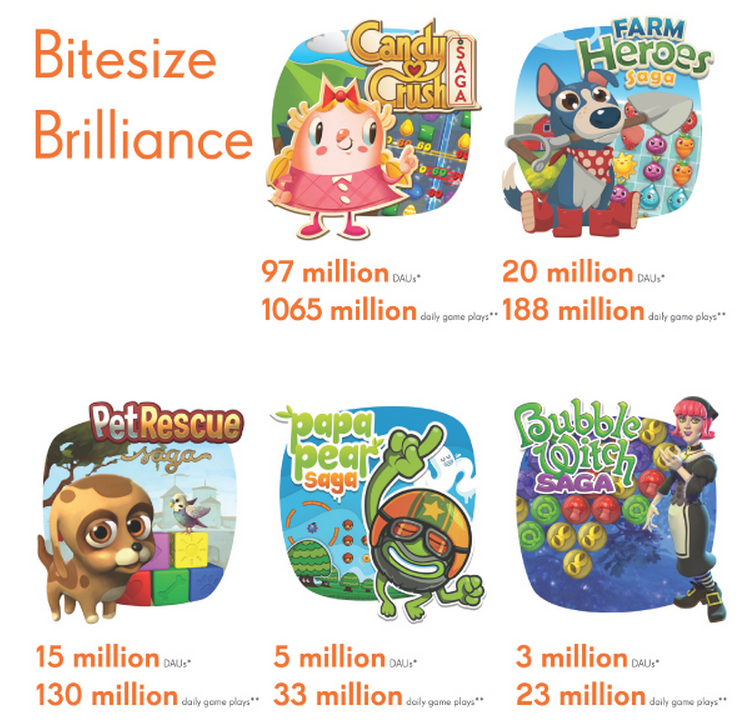 In today’s updated filing, King noted that in February 2014, “an average of 144 million daily active users played our games more than 1.4 billion times per day.” “We believe Candy Crush Saga, our top title to date, is one of the largest interactive entertainment franchises of all time,” the company wrote in the filing. That game alone brings in some 97 million daily active users and over 1 billion daily game plays. King derives its revenues from in-game purchases — in fact it wound down advertising on its platform last year. That has led to a big boom in sales, with King pulling in $1.88 billion in revenues in 2013, up from only $164 million in 2012. The company is banking heavily on mobile for future growth. In Q4 2013, 73% of its gross bookings were from its mobile audience. The main reason to go public, however, could just be that the IPO market is so frothy right now that companies have to have the credible threat of an IPO in order to get the best possible price from a strategic acquirer. Right until the day before the IPO, King is going to retain the option to simply sell itself to some company which wants proven expertise at making enormous profits in the world of mobile-native apps. By moving towards an IPO, King is forcing those companies to get serious about making an offer. Regardless of whether such a development happens, for now expect King to trade as KING on the NYSE when it goes public.